A fun movie about going back in time to a more innocent age that is part back to the future, part big, yet still ends up feeling like its own thing. Peggy Sue Got Married is an entertaining movie about a woman who is unhappy in her adult life and passes out one night while at her highschool reunion. When she wakes up, she is back in the past, reliving her highschool days, only she is the adult inside, with all of the knowledge she has accumulated in those years that have passed. The movie takes her back to the fifties, and it definitely has a back to the future feel, but that movie was all about time travel. This one is more about the high school life, once she is there. Nicholas Cage plays the man who is supposed to become her husband in the future, but things might not work out the same way they did the first time around. the movie has a number of fun storylines and interesting characters, all working themselves into Peggy’s life at the same time. The result is a lot of fun. Peggy Sue Got Married is a very entertaining movie. I was kind of surprised to like it as much as I did, because the formula definitely seems like it should feel as if we’ve seen it before. It’s about a girl going back in time. She gets knocked unconscious one night and when she wakes up, she’s back in high school. Now there have been plenty of back-in-time movies. I’m not talking about traveling back into history, but traveling back into your own life. “Back To The Future” is probably the most known of these films, but even that was very different because Marty McFly traveled back to when his parents were young, whereas Peggy Sue ends up going back into her own youth. The movie happens to be pretty funny. Peggy as a now divorced adult, who has a teenage daughter (Helen Hunt, when she was very young), is a character that is a whole lot smarter now than she used to be. The movie starts her out in the present time, going to a high school reunion, and Peggy Sue (played by Kathleen Turner), isn’t exactly ms. confident. She is nervous about the reunion, ends up wearing a ridiculous dress, and when she is called on stage to win an award, she faints. But nervous and embarrassed as she is in the present time, the adult Peggy Sue who goes back in time and lives in a high scholar’s body, is actually very confident, once she gets to the past. How can she not be when she knows exactly what the future will bring, what new discoveries and fads will come out, and how ridiculous everyone looks here, in the fifties. I really like the way this movie takes her back into high school and shows us what life was like for those kids back in that time period. It was the days of leather jackets, motorcycles, male singing groups, and rebel without a cause. I also like the way the movie has fun with the idea that Peggy is an adult being treated like she is a kid again. She drinks alcohol and gets in trouble with her parents for doing it. Her mom puts her to bed. And when her grandmother, who in the future is long dead, ends up calling up the house, Peggy Sues answers the phone and freezes up when she hears the woman’s voice. She can’t talk to her. It is just too surreal, like hearing a voice from the grave. 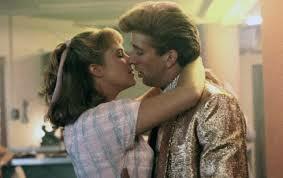 Aside from the back in time story, Peggy Sue got married is also a romance. There are actually a number of men who she ends up having relationships with, not all of them physical. First and foremost, there’s the man who she will end up marrying, crazy Charlie, played by a really young Nicholas Cage. He’s got blonde hair, talks kind of like a surfer dude, and was about eighteen when he made this movie. Just like in Moonstruck, which he made around the same time period as this movie, cage isn’t afraid to try different voices here and let he look silly. If only he did that in movies today, things might actually be different for him. Instead, cage’s career has become a sort of punch line in the last ten years or so. Because of how many bad and routine movies he has made. Peggy Sue got married shows him back when he was a star with promise, trying different things out, and not afraid to get wild. Aside from crazy Charlie, the appliance guy with aspirations for a singing career, there are two other men in Peggy Sues’ life. One of them is the kid from the wrong side of the tracks. That’s Michael, the rebellious poet who sits in coffee shops reading and rides a motorcycle around town. Peggy Sue finds him at the coffee shop, goes in and sits down at the table with him one night, and then rides off with him to an empty field for some wild and crazy fun. This turns out to be just a one-night fling, and for Peggy, it’s with a guy who she always wanted to get with and looked back on, from her adult life, as the dreamiest guy in school. Another guy is Richard, the nerd of the school who is all about science and trying to invent things. In the future, he really does invent something big, and makes a lot of money. Back in the past, Peggy thinks that he’s the only guy who might believe her about time travel and where she came from, and so she confides in him. He doesn’t believe her at first, but after she finds a couple of ways to prove it, he’s on board for whatever stories she has to tell him. I like how we see a whole bunch of these high school characters, including Richard, one of Charlie’s friends, played by Jim Carrey, and another guy played by That 70s Show’s Don Stark, both in the future, and then again in high school. We see them for the first time at the reunion, and then when we meet them back when they were kids, its kind of fun. We get to see Don Stark, for example, as a bully who is always picking on Richard. There’s also an annoying girl who interviews people in the future, and was completely into everybody’s business back when they were in the past. She’s the one who tells Peggy’s friends about Peggy’s wild night with Michael. I also like the way each character seems real and genuine, and none seem like a cardboard cliché. Charlie, for example, is not the villain that one might expect from the beginning of the film. Sure, things didn’t work out for him and Peggy Sue in the future, with them getting divorced, but that doesn’t mean he was a jerk in the past. It’s funny to watch her come onto him, and then watch Charlie be the one to have to push her away. I also like the subplot where he is trying to make it big as a singer, tries out in front of a producer, and then has to deal with some rejection. I would have liked to see more of Charlie’s friends in the past, particularly the Jim Carrey character, but I suppose Charlie wasn’t the star of the film. Peggy Sue is, and we certainly spend a lot of time with her friends (including a young Joan Allen.) there are so many famous names and faces here, from Peggy’s daughter to her sister (played by Sophia Coppola.) The movie has a lot going on, and I like the way it all plays out. This is the kind of film that I can totally see them remaking at some point, and it would actually be a pretty good idea. After all, the movie might have been made in the eighties, but Peggy Sue still seems pretty cool when she goes back in time. Especially when compared to the kids from the fifties. It’s the same effect the Marty McFly character has in back to the future, when he is compared to the kids from the past (interestingly enough, both movies go back to the fifties.) This was a very entertaining and clever film.